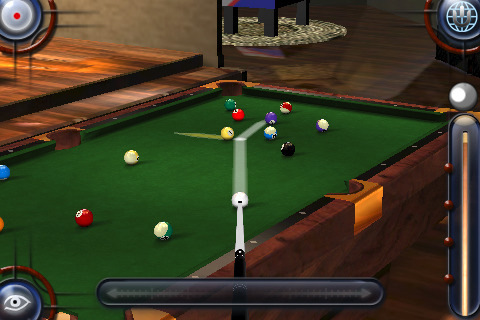 Pool Pro 3 Online from Namco is a realistic billiards game for the iPhone and iPod touch featuring crisp, colorful 3D models of 8 Ball, 9 Ball, and Snooker pool games that you can play either against the device as single player, or against online opponents in Multi Player mode. The game also features a Pro Shop where you can buy and manage a wide variety of pool tables, pool cues, and pool halls. If you’ve every played pool games on your PC or MAC you know how they behave with having to point and aim your cue stick and pull/release movements, and PPO 3 is no different, only more fun to play since it sits in the palm of your hands. You can choose form 4 difficulty levels (easy, medium, hard, and pro) and get started quickly in the Single Player mode. The graphics in Pool Pro 3 Online are nearly perfect, and the mood is set with a nice selection of smooth poolhall jazz filler music in the background. The balls are extremely shiny and polished, the table is a perfect felt green with a deep dark wood table and sitting in a large hard wood floor room, complete with a bar and lounge. To aim you just drag the stick using your fingers up/down/left/right and to get the perfect pinpoint accuracy you can then fine tune your positioning using a horizontal slider on the bottom of the screen. You can also change camera angles to either a top down view or a 3D view by tapping the eye button. You can also change the contact position to put some “english” on your shots. There is a semi transparent white guide that helps show you where your shot will end up using an arrow. Shoot using a pinball like pull/release lever on the right side of the screen. Colliding balls make the perfect sound effects that make the game feel even more realistic. When your opponent is shooting you can change camera angles to one of 5 different options in real time to see the action from every possible position. Breaking gives you the ball to place behind the shooting line. Scratching gives the ball back to your opponent, with “ball in hand” that you can place and strike. You call the pocket on the 8 ball by tapping one of six pockets to indicate your intended target. You can fast forward the other player’s moves by tapping a forward button. Yes the game can get a little too slow sometimes, but that’s the inner zen and calm of billiards. Multi-player support is wonderful and gives you an opportunity to show your skills to your friends in pass and play or peer to peer mode, or the world in Online mode. Place a wager and pick a player from the lobby to start an online game. There weren’t too many people in the lobby at the time we tested the game, maybe 4 or so, but we were able to start a game easily. During the online game you can chat with your opponent and you get voice notifications of when your turn is up. There is a timer that limits your time to make a move. Preferences let you lower the semi-too loud background music, change the sound effects volume, enable ball popup feature, and accept wagering. Online board supports achievements, leaderboards, and a friends list. The only issues we had were, 1: the pace of the game can feel a little slow at times, and 2: not a whole lot of users in online mode to play against, which probably has to do with the 5 dollar price tag of the game. A lite/freemium version would definitely help improve this issue. Pool Pro 3 Online is probably the most comprehensive well designed iPhone pool game we’ve played and is worth grabbing if you’re into playing pool and are interested in the online challenge aspect, which implemented well. It’s not a quick pickup and play game, but it has killer graphics, a load of options and is a great way to relax and kill some time, and it might even help improve your real billiard skills. AppSafari review of Pool Pro 3 Online was written by Joe Seifi on March 13th, 2010 and categorized under App Store, Featured, Fun, Games, Multiplayer, Sports. Page viewed 6151 times, 1 so far today. Need help on using these apps? Please read the Help Page.